The autumn equinox has passed. That means the days are growing shorter, the nights longer. In my recent discussion of the hokku Wheel of the Year, I emphasized how very important the seasons are to hokku. It is a new concept for many people — writing in keeping with the seasons — but it is nonetheless a very old practice. Hokku, you will recall, are about Nature and the place of humans within and as a part of Nature, set in the changing seasons. In autumn, autumn hokku are written. To do that, one has to understand the character of autumn — what it is like, and how it manifests in Nature. As are all seasons, autumn is a stage in the interplay of the two forces, Yin and Yang. In autumn Yang is decreasing and Yin increasing, and that is particularly obvious after the autumn equinox has passed. Withering and dying are Yin, and in autumn we see plants and leaves begin to wither and die. Cold is Yin, and in autumn we feel the air growing ever cooler as the sun declines lower and lower in its arc across the sky. Darkness is Yin, and in autumn darkness (night) grows while light (the day) wanes. Things that retreat or fall are Yin, and in autumn the sap retreats from twigs and branches in trees and leaves begin to fall; in annual plants the energy has gone into the seeds, and in many perennial plants the life energy leaves the withering, visible part of the plant and retreats to the root. So in autumn, the general feeling is of withdrawal, of “returning to the root.” It is a preparation for the quiet and chilly days of winter, the beginning of a natural turning inward. It may interest you, in this regard, to know the basics of the traditional Five Elements associated with seasonal change. Summer was a “fire” season, as you might guess from its very Yang character. As Yang began to weaken in late summer, the element changed to earth. Now that autumn is here, the predominant element is metal. And when winter comes, the element will be water, to be followed in spring by the wood element. These are significant because all relate to processes in the human body and its cycles of energy. For example, now is a good time to begin adding lots of “black” foods to your diet. Why? Because foods black in color relate to and strengthen the “water” element in your body, and after the “metal” season of autumn comes the “water” season of winter, so eating black foods now helps you to prepare your system for winter; that is good for your kidneys and your basic energy, which are also “water” element-related. There is much more to say about this and the relationship between the seasons and health, but this aspect is not so important to writing hokku, except in so far as it helps to keep you even more attuned to the seasons and their changes. So I will not talk more about it now, but encourage those interested to learn at least the simple basics of the traditional Five Elements Theory. You will find many web sites that give charts showing the interrelationships of the seasons, the five elements, appropriate helpful seasonal foods, and the cycle of the body. Autumn is often thought of as a time of travel, of migration. That is because it is the time when migratory birds take the long journey to where they will spend the winter, and animals move from their summer haunts to places where they will winter. So that feeling of “changing homes,” of being a rootless traveller, is very in keeping with the atmosphere of autumn. So Buson says that just by walking out his gate in autumn, he too becomes a part of this feeling of “migration,” and now you understand better why this is a hokku appropriate to the season. It is appropriate too that the hokku is set in the evening, when the light is waning and darkness coming on, because of course increasing darkness is increasing Yin, and autumn itself is a time of increasing Yin. So this verse uses two things associated with autumn — travel and the waning of the day. You will recall that in hokku correspondences, Autumn relates to the time from late afternoon to early evening, and in human life to the time past middle age through the onset of old age. So we can see that Buson’s verse uses “harmony of similarity,” the putting together in a hokku of things that reflect one another by having a similar character. In this verse both travel and the coming of evening relate to autumn. Of these two aspects, the content takes some time to absorb, particularly the aesthetic spirit characterizing hokku. The form, on the other hand, takes only a few minutes. It can easily be described and learned. 1. Written in three lines. The first letter of each line is capitalized. A hokku has one or more internal punctuation marks, and an ending punctuation mark. 3. Divided into two parts, one longer, one shorter. The long part consists of two lines, the short part of only one line. The short part may begin or end the verse. An appropriate punctuation mark separates the two parts of a hokku. Punctuation in hokku is simple. A period (.) or other appropriate punctuation ends a hokku. A semicolon is used for a meditative pause. A dash (–), typed as two hyphens, indicates a longer meditative pause. Ellipses (…) may serve a similar function. A comma (,)indicates a short, connective pause. An exclamation point indicates something unusual, unexpected, surprising, or strongly emphasized. It is used rarely. A question mark (?) indicates an asked but unanswered question. The simplicity and practicality of the hokku form in English enables the writer to concentrate on form. At the top of the verse comes its overall seasonal setting, in this case autumn. Many verses have no secondary punctuation before the ending mark, but they always have the primary punctuation mark separating the long and short parts of the hokku. Just which punctuation mark to use in a given case depends upon how the writer wishes the verse to be read. Punctuation is used to guide the reader through the verse easily and without confusion, but it also provides fine shades of pause and emphasis that vary depending on which mark is employed. Now you know the outer form of hokku, and you should be able to easily use it. The trick, however, is to learn how to put good and effective content into that form, and learning that comprises all the rest of hokku. Hopkins, in speaking of the vanished trees, says Their “airy cages,” meaning their intertwined leaf-covered branches, sometimes made the bright sunlight more subdued (“quelled”), sometimes blocked the light entirely. By “leaping sun” he may mean the illusion caused by the moving of branches and fluttering of leaves, which makes the light seen through them seem to leap from place to place; or he may mean simply the sun rising in the East and passing over the line of trees (they were oriented in a northwesterly direction) to sink again in the West. Not one of the “fresh and following folded rank” of trees was spared, he tells us. By “following folded rank” he means simply the line of trees with their individual heights and gaps between them making a vertical “fold”; Not one was spared, not one that “dandled [“dangled”] a sandalled shadow.” He seems to liken the trees to a person dangling a sandalled foot lightly against the water, he may mean simply the “footprint” of the shadow on shore and water, or he even may, as some say (though it seems rather unlikely), be referring to the interlacing shadows of branches, likened to the lacings on a sandal. He says the shadow “swam or sank on meadow and river…and bank,” meaning the shadow appeared both on the surface and beneath the surface of the water, as well as rising or falling with the little swells and depressions in the land. When he calls the bank “wind-wandering” and “weed-winding,” we may wonder if he intends “wind-” in the first case to have a short “i,” meaning “breeze,” or if he intends it with a long “i” (meaning “meandering”) as used in “weed-winding.” I think he means “wind” as in “breeze,” — signifiying not only that the wind wanders along the bank but also that the bank wanders like the wind. And when he says “weed-winding bank,” he seems to again use a double meaning, signifying the weeds winding (tangling) on the bank, as well as the bank wandering like a weed (the Thames curves at Binsey). We should not be surprised at the vagueness of Hopkins, who seems to often leave us with multiple and intertwining possibilities of meaning. “Oh,” he says, if we only knew what we do when we delve (“dig) or hew (“cut”) Nature, when we “hack and rack the growing green.” Hopkins uses the word “rack” here in an unusual sense that is based more on its meaning as a noun (“destruction, ruin”) than on its usual meaning as a verb. The rural countryside is so tender that to touch “her,” given that she/it is so “slender” (meaning “delicate, sensitive” here) is as risky as pricking the smooth ball of the human eye, which can destroy it. So even if we mean to mend (“repair”) Nature, we often instead merely do harm when we dig or excavate. There are abundant examples of the results of interfering with Nature, some of them well intended, some not — in the history of human interaction with the natural environment, and we see them still in the daily news. “Binsey Poplars” is one of those Hopkins poems that is rather simple in subject but complicated by his unusual use of language. Nonetheless, in spite of his occasional vagueness and implied multiple meanings, the overall sense of the poem is quite clear, and we can easily relate to his feelings on the matter. Nonetheless, we should be aware that though Hopkins knew poplars well poetically, he did not know them well botanically. European poplars (Populus tremula) decline and decay within a period of about 100-150 years, requiring replacement by replanting if one wants to maintain an avenue of them. In fact not long after Hopkins passed through the apparent devastation of the felled Binsey poplars, they were replanted. 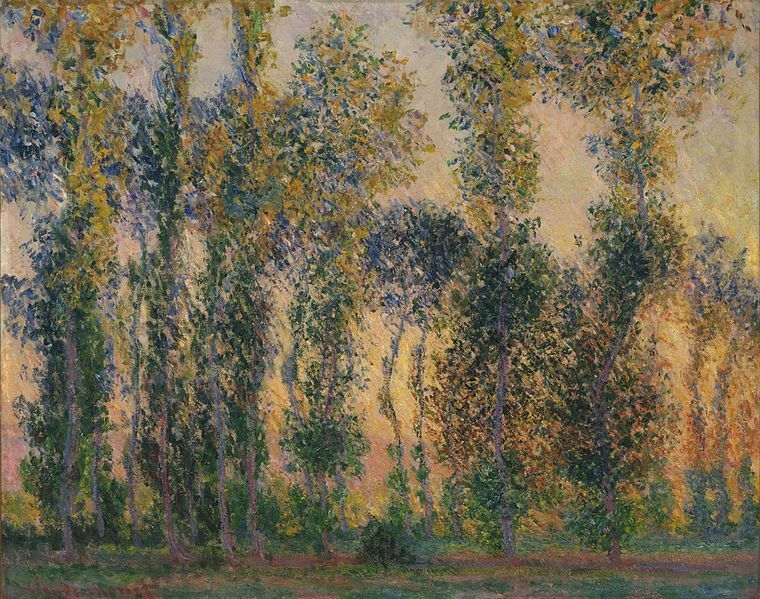 By 2004 the poplars at Binsey had again begun to decline, and so replanting was begun again. So in this case, the “sweet especial rural scene” was more resilient than Hopkins knew. That does not, however, obviate the point of his poem, which is that humans should be more sensitive to Nature, to natural beauty, and to what is done to it. We can see what happens when humans abuse Nature in countless cases of destruction and disaster that are immeasurably more difficult to mend than the cutting of the poplars at Binsey. In the spring of 1880 Gerard Manley Hopkins was working as a Catholic priest in a slum district of Liverpool, a district which, at that time, was a very unpleasant place with an appallingly high disease and death rate. This was in the days before the car, a time when dray horses — “work” horses — hauled goods in wooden wagons with iron-rimmed wheels. Work horses are strikingly unlike ordinary horses; they are high and massive, standing some six feet high at the shoulder — and very strong. Today’s poem is an odd combination; on the one hand it is quite businesslike, dealing matter-of-factly with the rites and services a Catholic priest was expected, as his duty, to provide to the seriously ill, but behind that it seems to be a tender and rather loving meditation on the death of one particular man. That man was Felix Spencer, a sturdily-built young farrier. 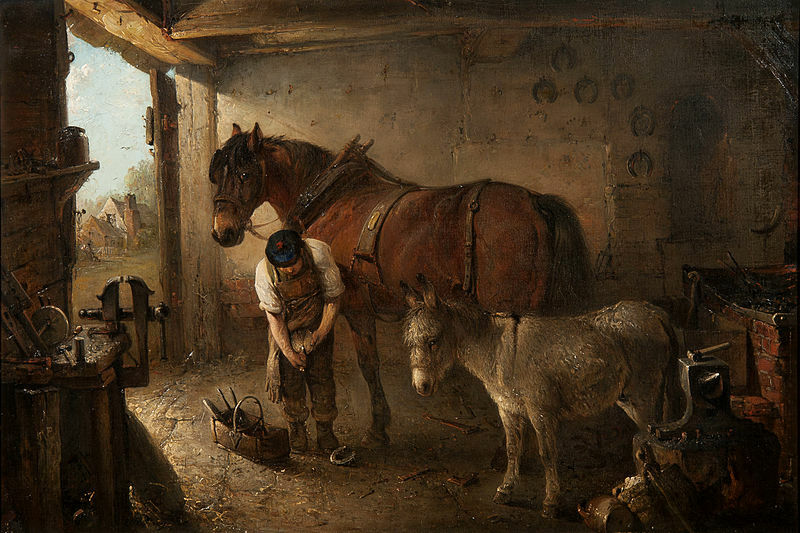 A farrier was one who could do the blacksmith’s work of making horseshoes, fitting and nailing them to the horse’s hooves, as well as undertaking the skilled trimming and tending of the hooves. It was a very “masculine” profession in feeling and required a good deal of strength as well as practical anatomical knowledge of horses. 2. “Is my duty as priest to him ended…?” But he does not stop there; he recalls “his mould (“kind,” “form”) of man, big-boned and hardy-handsome,” he sees in memory the sturdy body of Felix, handsome in a hardy, well-built and imposing way. But he sees also the changes wrought by illness — that sturdy body “pining, pining,” meaning declining and weakening. And finally he sees the time when about four ultimately fatal physical disorders (what we call today “complications”) manifested in his body (“fleshed there”). These disorders all struggled with one another and ultimately killed the poor man, so ill near the end that his mind had become confused (“reason rambled in it”). Though it may seem peculiar to us, Hopkins puts the question mark not after “my duty all ended,” but all the way at the end of the long description of the body and its fading. Hopkins remarks on his visits to Felix in a general way, saying “This seeing the sick endears them to us” — we develop an affection for the ill when we visit them and see their suffering, yet it also “endears” us — not only endearing us to the ill, but we tend to become better, more compassionate ourselves. Hopkins had comforted Felix with soothing words (“My tongue had taught thee comfort”), had laid his hand upon him fondly (touch had quenched thy tears,” and the tears Felix shed also touched Hopkins deeply, as we see in the lamenting, simple words, “child, Felix, poor Felix Randal.” Hopkins had developed a real affection for the man, and I suspect that he is underplaying it here because he does not want to admit its depth to himself or to others — remember that Hopkins was homosexual. He seems to have been struck by how different a man Felix was in form and function from the quiet, physically undeveloped and bookish nature of Hopkins himself. Hopkins ponders how far Felix was, in the weak and broken condition of his last days, from the boisterous years of his previous life when he stood working at the “random grim forge.” “Random” here is used in its old meaning of “with great force or violence,” and “grim” in its old sense of “fierce.” Hopkins deliberately blurs the application of the adjectives so that they apply not only to the fiery forge but also to the hammering of the horseshoe on the anvil and to Felix himself. Hopkins sees Felix standing, powerful and grim, before the fierce fire of the forge, violently beating the white-hot metal of the horseshoes with great force behind the blows of the hammer. There he stood in those happier, earlier days, “powerful amidst peers,” that is, he stood strong amid the strength of fire and iron and massive horses, as well as being strong among other sturdy men of his kind. He could have had no forethought in those days of strength of his future illness and final fatal weakness. So blissfully unaware of what lay in store for him, he fettled ( using “fettle in its sense of “to make ready”) a horseshoe for the great, gray drayhorse (a horse that pulls a dray, a large wagon for transporting goods). Hopkins calls the horseshoe “his (the horse’s) bright and battering sandle,” because horseshoes not only become bright when they are forged white-hot, but also become bright when polished by wear. The horseshoe is “battering” not only because the farrier batters it with a hammer when making it, but also because the iron shoe batters against the cobblestones of the streets as the horse pulls the wagon. Well, that is the poem. I do not think it is one of his best, and that, I suspect, is because Hopkins held back a bit, being of two minds, either consciously or unconsciously, about revealing to himself and to others too much about his feelings concerning the once “hardy-handsome” Felix Spencer — “Felix Randal” in the poem. But of course we must be careful not to read too much into this. As he often does, Hopkins makes things more difficult than need be by his liking for old meanings of words and unusual expressions, but without that he would not be Hopkins, would he? In recent review postings I discussed internal reflection in hokku — how similar things interact within a verse — and I discussed the technique of harmony of similarity. You will recall that harmony of similarity is the combining of things with similar characteristics, for example an assemblage of things that are aging or old, or things that are Yin in nature or things that are Yang in nature. When we combine things with similar characteristics (such as the billowing sail on a boat and billowing clouds) or energies (such as an old woman and autumn — both increasing Yin), that creates a very harmonious feeling. Today we will add to that another technique, harmony of contrast. Harmony of contrast is the use of elements that are felt to be contrasting or opposite in their characteristics (such as an old woman looking at apple blossoms in spring) or energies (such as stepping into a cool stream — Yin — on a hot day — Yang). As you might imagine, the combining of contrasting things can be particularly effective in the two seasons when energies reach their maximum — Yang in summer and Yin in winter. But it can also be used in the two seasons when Yang is increasing as Yin declines (spring) and when Yang is declining and Yin is increasing (autumn). Of course it is the moon seen at night in the water of the basin. We see harmony of contrast between the boisterous music and activity of the dance (now ended) and the peaceful, quiet sounds of the wind in the pines and the crying insects. But there is also similarity between the “natural” sound of the wind and that of the insect cries. There is a mild similarity between hair and the feathery plumes of pampas grass trembling in the (implied) wind, but if we think of the writer as OLD, the effect becomes even stronger — the grey, long and unkempt wisps of an old man’s hair trembling in the same autumn wind that blows the white, withered pampas grass. But if the hair trembling in the autumn wind is that of a YOUNG man, then the feeling of the verse becomes quite different, not nearly so harmonious with the season. The reason it works is that the absence of something can often be just as strong, or sometimes even stronger, than something that is present. Imagine, for example, seeing the empty and silent rocker in which a beloved grandmother used to sit. That is a very meaningful absence. What these techniques teach us, aside from being frequently useful in composition, is to pay great attention to the interrelationships among the elements you put into a hokku. You should always remember that a good hokku is not just an assemblage of random elements. It is not just picking anything you see and writing about it in three lines. It is noticing events in which we FEEL the relationship among the elements and their relationship with the season, whether that relationship is one of similarity or contrast, or even a mixture of the two. That is what gives a hokku depth and significance. Keep in mind too, that the feeling of an element changes with the season. Spring rain is very different in feeling from summer rain; and autumn rain has its own feeling, as does winter rain, which is quite different than spring rain. That is why we should keep in mind that underlying the obvious subject of a hokku is also the more encompassing subject — the season in which the verse is written. All hokku, you will remember, should be written in the appropriate season. We do not write winter hokku in summer or fall hokku in spring. And we ordinarily also read hokku in the appropriate season. We do not read summer hokku in winter or spring hokku in autumn. This practice keeps us in harmony with the seasons, and avoids creating the sense of inappropriateness we feel when seeing artificially grown spring flowers in an autumn bouquet, or when dried autumn plants and seed pods are used in a spring bouquet. In the previous posting I discussed the Hokku Wheel of the Year, the hokku calendar that is in essence remarkably close to the old calendar not only of the hokku writers of old Japan but also that of the old Chinese poets, with only slight variation, though of course the names of the chief seasonal points differ. Spring: Yang grows as Yin declines. Summer: Yang grows until it reaches its maximum at Midsummer’s Day, then gradually declines as Yin begins to increase. Autumn/Fall: Yang declines even more as Yin continues to increase. Winter: Yin increases until it reaches its maximum at Yule, the Winter Solstice, then gradually declines as Yang begins to increase. You will recall that Yang is the energy of warmth and activity; Yin is the energy of cold and passivity. So we think of spring and summer as being increasingly warm and filled with activity in Nature, while we think of autumn and winter as being increasingly cold and a time of growing inactivity in Nature. Hokku is about Nature and the place of humans within and as a part of Nature, set in the context of the seasons. Every hokku is set in a particular season, because that season not only connects us with the natural world, but it also provides the environment — the context — in which a hokku event happens. That means the seasons are an integral part of hokku. In old Japanese hokku the seasonal connection was made in each verse by using a season word that by accepted convention indicated a particular season. Anyone wanting to write or understand hokku had to learn those season words in order to know (except when obvious) the season in which each verse was set. Over time the number of such words greatly increased, until near the end of the old hokku period, it required years for one to learn the season words and how to use them properly, a growing complexity that was not really in keeping with the natural simplicity of hokku. The old season words were also based on a particular and rather limited climatic region of Japan, as well as upon plants, animals, birds and fish within that particular region. Can you imagine how complex and difficult it would be if we expanded that region worldwide and included not only all climatic regions but all natural life? That is why in modern English-language hokku, we take away the complexity and return to the simplicity favored in hokku, by using only four seasonal markers — the four seasons. Every hokku, when written, should be marked with the season in which it is written. That way, when it is shared with others the season goes with the hokku. And if a group of such hokku are gathered into a collection or anthology, all the verses can be easily classified under their respective seasons. This takes a huge burden away from learning hokku today while still keeping the essential connection to the seasons. So now you know a lot about the seasons and the cyclic changes in Yang and Yin energy through the year. That brings us to the important matter of internal reflection. In plant life: sprouting, growing, blossoming. In plant life: maturing, fruiting. In plant life: plants “gone to seed,” leaves withering and falling. In the day: after sunset to deep night. These are just some of the most obvious correspondences/reflections. So how do such reflections manifest in hokku? By putting together things that are the same in character. This is called harmony of similarity. An old man walking in the autumn amid falling leaves. As you can easily see, everything in this verse has the character of weakening Yang and increasing Yin. The year is old (autumn), the man is old, and the leaves are old. That is why this combination gives us a feeling of harmony, the feeling that these things just “go together.” That is harmony of similarity, and it is achieved by using, in this case, things that reflect the nature of autumn, Yin things. A child picking snowdrops amid the melting snow. That is very obviously a collection of “beginnings” The child is young (beginning life), the snowdrops have just sprouted into bloom and are “new,” and the melting snow shows us the increasing of the Yang (warm) energy. So it automatically makes us feel the sense of newness and fresh beginnings of the early spring. You should easily be able to see the internal reflections. Just in case you have overlooked one of the elements, I will remind you that bright things are Yang, dark things are Yin. Do you see now how each element in the verse reflects the others? A withered branch is an old branch, so that gives us the sense of age, which is Yin. The crow is, of course, black; and darkness is a Yin element. Also, the crow has settled into inactivity, which is also Yin. Autumn is the time of increasing Yin; evening is also a Yin time in the day. So everything in this verse is Yin, everything has to do with aging, and there is a correspondence between the darkness of the crow and the gathering darkness of evening, as well as the reflection of the withering of nature in autumn with the withered branch on which the crow has perched. It is very important to see that these corresponding elements reflect one another. The Yin we see in one, we also see manifested in some way in the others. Do not mistake this for symbolism. Each element is fully itself, while also being fully in harmony with the others and with the autumn season. Graves, of course, we associate with the passage of life and with and death, and both aging and death are Yin elements. It makes all the difference that the dog is old. His age is in harmony with the season (Autumn – increasing Yin), and with the graves (death = maximum Yin). So both are Yin subjects, set in a season of increasing yin, a season of withering and dying. We can see the dog, showing his age in the slow pace of his walk, taking the lead on a path he has gone down many times. That gives us a completely different feeling, and that feeling is not quite right. It lacks the harmony of Issa’s verse, though there is a place for using contrasting elements, as we shall find. Now you know about internal reflection in hokku as well as harmony of similarity. In the next posting I will discuss a different (but related) technique, harmony of contrast. It too is based upon Yin and Yang, but it creates a different, yet still harmonious effect by using “opposite” elements. By the way, if all of this seems a little difficult, it is only because it is likely new to you. Once you are accustomed to this way of thinking you will easily and naturally see such correspondences. But to do this well, you must know about Yin and Yang, so if those are not clear in your mind, just review the previous posting with its list of characterics of Yin and Yang. If you want to really understand hokku you will need to know its aesthetics, the principles upon which its practice is based. The chief underlying principle is that everything in the universe is connected. Humans are not separate, but are a part of Nature. That is why we can say that hokku is about Nature and humans as a part of Nature. Nature implies the seasons and their changes. That is why learning the Hokku Wheel of the Year is a part of the basics of hokku aesthetics. The Wheel of the Year is the “natural” calendar. Here is a simple image of the Hokku Wheel of the Year as found in English-language hokku. Some of you may have seen the similar Wheel used by modern “pagan” groups. If so, you will immediately note a significant difference. 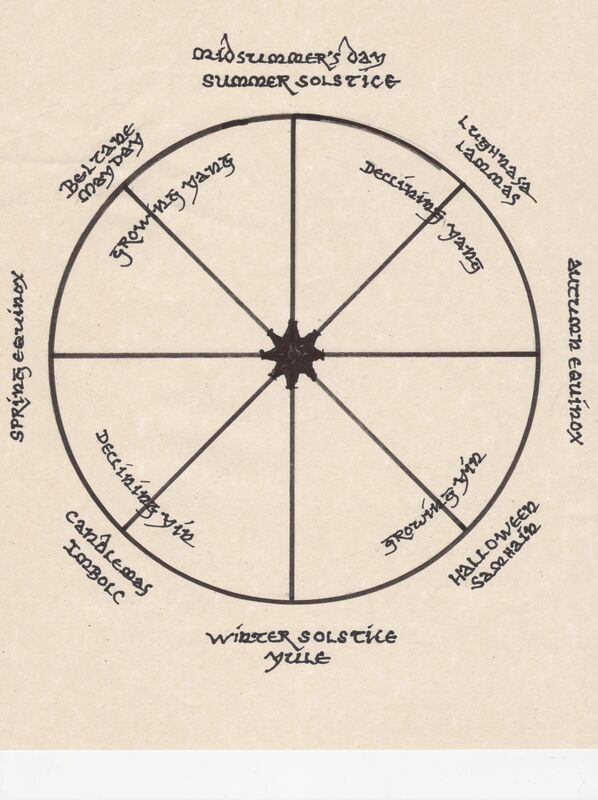 In the hokku Wheel of the Year, Midsummer’s Day is at the top, and the Winter Solstice is at the bottom. There is a very good reason for that, as you will see as we continue. 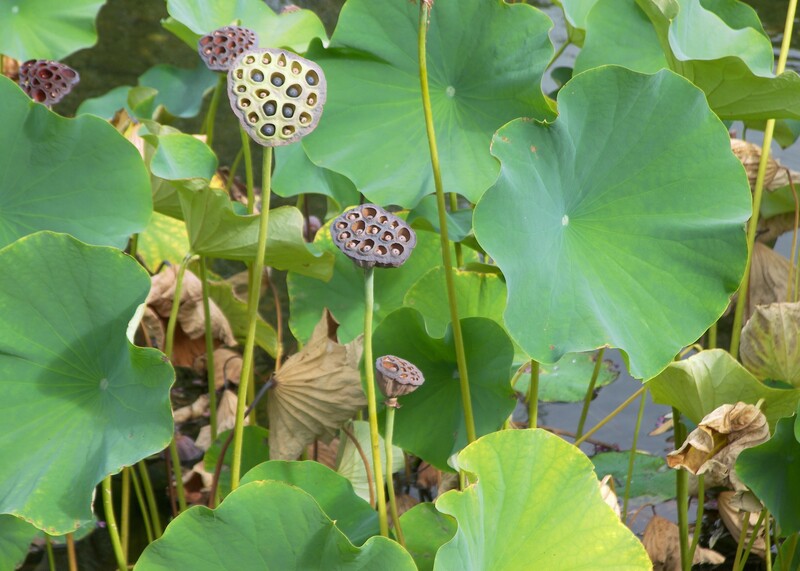 You will also note on the Hokku Wheel that in the spring, the Yang aspect of Nature is increasing. This increase really begins in midwinter, just after the Winter Solstice, but it begins to be noticeable near the time of Candlemas and after. Yang increases until Midsummer’s Day, at which time it begins its decline, though its effects, like those of midwinter, are usually not noticed in Nature until about a month later. As Yang declines in late summer, its opposite Yin gradually increases. So in autumn we have increasing Yin, and in spring we have decreasing Yin. The principles of Yin and Yang and their interactions and transformations give us the seasons of the year. You will recall that Yin is cold, Yang warm. Yin is passive, Yang active. Yin recedes, Yang advances. Yin is wet, Yang is dry. Yin is still, Yang moving. Yin is silence, Yang is sound. Yin sinks, Yang rises. Remembering also that when Yin or Yang reaches its farthest point — its maximum — it begins to change into its opposite, we are now ready to look at the real calendar — the seasons according to Yin and Yang. Midwinter is ultimate Yin. At this point Yin reaches its maximum and begins to change into its opposite. Yang first begins to grow within it. So Midwinter is a pivotal point, the lowest on the turning wheel of the year. Its opposite is Midsummer, when Yang reaches its maximum and then begins to change into its opposite. Yin begins to grow within it. So Midsummer also is a pivotal point — the very height of summer, when it then begins its long decline into winter. The Spring Equinox — a time when day and night are of equal length — is nonetheless a time of growing Yang, because it comes after Midwinter. Yang continues to grow until Midsummer, when it then begins to change into its opposite. The Autumn Equinox — again a time when day and night are of equal length — is nonetheless a time of decreasing Yang and growing Yin, because it comes after Midsummer. Yin continues to increase until Midwinter, when the cycle begins again. So we see there are two Yang seasons — spring and summer — and two Yin seasons — autumn and winter. I often talk about Yin and Yang in hokku. In fact I talk about them so much that another name for the kind of hokku I teach might be “Yin-Yang” hokku. That is how important it is — so important that one cannot fully understand hokku without it. In old Asia and in hokku, it was something people grew up with. It was even the principle upon which old traditional Asian medicine and philosophy were based. But it has to be actually taught to Western students, because they generally are not familiar with it. I will try to make it brief, so this posting will condense a lot of information that the student should absorb and then observe in daily life and in the reading and practice of hokku. Yin and Yang are the two opposite, yet complementary forces comprising all things in the universe. They are found in every aspect of Nature, so you can understand why they are so important in hokku. Even though Yin and Yang are opposites, they interact with one another in an ever-changing relationship and harmony. So we should think of the universe as not being just divided into two — Yin and Yang. In fact, it is not divided at all, as we see from the circle of the symbol, and Yin and Yang mix together and change together. When Yang increases, Yin decreases; when Yin increases, Yang decreases. What exactly are Yin and Yang in practical terms? This is very ancient knowledge. That should give you some idea of Yin and Yang seen as absolutes, though they are not really absolutes. Yang contains within it a tiny seed of Yin; Yin contains within it a tiny seed of Yang. You see that in the Yin-Yang symbol on this page: the light Yang side contains a tiny spot of dark Yin; the dark Yin side contains a tiny spot of light Yang. 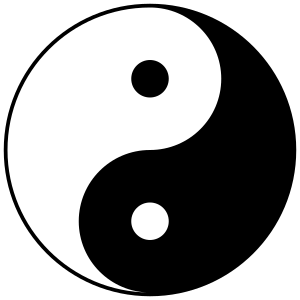 When Yang increases and reaches its ultimate, it changes to Yin; when Yin increases and reaches its ultimate, it changes to Yang. As already mentioned, everything in the universe is — at any moment — in some stage of the ever-changing interplay of Yin and Yang. In hokku this is significant not only because it is how the universe works, but also because of the principle of internal reflection. In hokku the nature or character of one thing is often reflected in the nature or character of another. In addition, in hokku there are two kinds of harmony: there is harmony of similarity, and harmony of contrast. Both of these important aspects of hokku relate to Yin and Yang. Winter is cold, so from the list above, we know that winter is very Yin. And we recall that when Yin reaches its ultimate, it changes into Yang. That is exactly what happens. In the cold Yin of deep winter, a tiny seed of Yang begins to grow. We call that “increasing Yang” or “growing Yang.” It grows and spring begins. So spring is increasing Yang. Yang continues to increase, and spring grows warmer, ice and snow melt, things sprout, blossoms appear, trees leaf out — all these are signs of growing Yang. Yang continues to grow, and we have already seen that when Yang increases, Yin decreases. That is what is happening in spring. Finally, Yang grows to such a point that things dry out, the weather begins to get very warm, and we find ourselves in summer, which, being the opposite of Yin winter, is a Yang season. The Yang of summer increases gradually until it reaches its height, and then — as we might expect — it begins to change into Yin. A seed of Yin starts to grow within it. Now the year, instead of growing as in spring, is declining. Yin continues to increase as Yang decreases, and we come to autumn, a time when the increase of Yin is very obvious as things begin to wither; the trees drop their leaves, annual plants die, and the energy of perennial plants sinks from the leaves into the root. We know that in spring, for example in sugar maples, sap rises — Yang. But in autumn it falls — Yin. Yin increases as Yang decreases, things grow colder, things increasingly die, and finally we are in winter again, the Yin season. Then the whole cycle begins anew. Birth and infancy are early spring; growth, childhood, and adolescence match the increasing Yang of spring. Adulthood is summer; when one is fully adult, the aging process begins. One grows gradually older — the autumn of life. And as Yang decreases in the human body and Yin increases, we grow even older and weaker, we lose our hair, we loose teeth and muscle, and finally Yin reaches its ultimate and we die — deep winter. The middle of night is deep Yin. Dawn nears and Yang increases. We see that in the light, and in the morning chorus of the birds. Then the sun rises higher in the sky and Yang increases even more, as Yin decreases. Finally, at midday, the sun reaches its highest point, and the seed of Yin begins to grow within it. The sun begins its afternoon decline and Yang declines as Yin grows. Then we reach late afternoon, dusk, and finally the Yin darkness of night comes again. We see Yin and Yang in the landscape and in landscape painting. Mountains rise up and are high, so they are Yang; valleys are low and receptive, so they are Yin. And of course we see Yin also in the falling of waterfalls from a high place to a low place. And we see Yin in rivers, lakes and pools. In fact so all-pervasive is the Yin-Yang process in Nature that one cannot really understand fully how hokku work without it. In some verses it is very obvious, in others less obvious, but it is always there, whether seen or not. Spring frost is Yin, which shows us that in this process Yang (seen in the dawn and the green blade) is increasing, yet Yin (what remains of winter) has not yet disappeared. You can see from all of that what a very excellent spring poem this hokku of Onitsura is. And if you did not have your new understanding of Yin and Yang, you would not see that at all. That is why the Yin-Yang principle is so essential to hokku as I teach it — because not only was it essential to old hokku, but it also is essential to understanding the interplay of these forces in everything that exists — in every time and place and life. If you have “been around the block,” as the saying goes — if you are familiar with books written on all kinds of short verse that are descended in one way or another from the hokku, and familiar with journals and internet sites, you will realize suddenly that I am the only person teaching this relationship of Yin and Yang in old and modern hokku. You will not find this teaching of how it relates to hokku in practice anywhere else. Why? Because other kinds of brief modern verse — modern haiku in particular — have largely abandoned the aesthetic principles and standards of the old hokku. Most never knew them to begin with. I am sure that one of these days someone will see what I have written on this subject and will begin presenting it on some modern haiku site as a novelty, but for us in the actual practice of hokku it is not just a novelty; it is essential knowledge. I hope you can see from what I have written here how much more there is to the hokku than superficially meets the eye, how one must have an understanding of its aesthetics in order to really “get” how hokku works and why it works, and how to apply these principles in practice. Once one knows about and begins to understand the Yin-Yang principle, one sees it everywhere — because it is everywhere, from deep in our bodies to the farthest galaxies, and in every aspect of life and time. That is why it is essential knowledge to the serious student of hokku. I should add that for the old writers of hokku, Yin and Yang were not a recipe for writing. They did not consciously think, “Now I must write a poem incorporating Yin and Yang in order to get a certain effect.” Yin and Yang were just a part of their cultural and aesthetic background, so they did not have to consciously consider their interactions in writing, for the most part. For us in the West, however, the interactions of Yin and Yang are not a part of our cultural background — at least not since a very long time — so the best way to deal with Yin and Yang is to learn the basic interactions I have given here; then practice recognizing the Yin – Yang processes in Nature and the seasons, as well as in old hokku. That way Yin and Yang will gradually become part of your hokku practice — your personal background — but not in any forced and rigid way. Keep in mind that the Wheel of the Year shown here is based upon the practice of English-language hokku in the temperate Northern Hemisphere. Modifications are necessary for the Southern Hemisphere, and for regions that may not have four distinct seasons; some places, for example, may have only a rainy season and a dry season. Hokku develops out of its natural surroundings and climate, so we do not artificially fit Nature in one place to an incompatible calendar that expresses quite a different region. Remember also that the Wheel of the Year presented here is, we could say, the “astronomical” calendar, with the four main points related to the position of the sun as it arcs across the sky. The seasons as they are perceived in the changes of the natural environment, however, arrive and depart at different times in different places. Winter will come earlier and spring later in more northerly climates and in the high mountains, while winter will arrive later and leave more quickly in more southerly regions and in the lowlands. So in addition to the Hokku Wheel of the Year calendar, we should also pay attention to the natural changes of the seasons in whatever region we may be living. I mentioned the technique of internal reflection. In my next posting on this subject, I will discuss how internal reflection manifests in autumn or “fall” hokku.